This was an interesting book. The mystery was good, the story was good, and I quite liked the historical setting and the history lesson. The writing was, for the most part, very good, with one glaring exception. In this book Michael Jecks switches point of view abruptly and sometimes painfully. I was confused several times when I thought the point of view was one character when it had switched to the point of view of another characters. Despite this glaring annoyance, it was still a good book and an interesting read. As he has written an entire series, my hope is that this part of his writing style improves as he continues to write, and also that he found an editor who was willing to fix these issues. I have books two and three in this series, and how this point of view issue resolves will determine whether I'll read any more of the series. But as I said, the story was very good, and I found the history fascinating. Set in the early 14th century, the Knights Templar have just be disbanded and hounded throughout France as heretics. The books starts with a bit of this history, as seen from the point of view of a monk who escapes the Inquisition. We then switch to England, where Simon Puttock has just been appointed bailiff of Lynford Castle. There is an interesting bit on precisely what a bailiff does, which I quite liked, since I imagined a bailiff as something else entirely. Although the transition between these two parts of the book was that abrupt, it didn't bother me, as the Templar bits were in the Prologue, and were a nice introduction to the time as well as to some of the methods of the Inquisition. Simon meets Sir Baldwin Furnshill, newly returned to the area, and both end up investigating the a murder in one of the villages in the area where Simon is now bailiff. 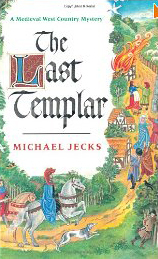 Michael Jecks does, to me, a good job describing like in the 14th century, making it far less glamorous than some historical novels, and much fantasy, would have us believe. The description of the buildings, including the differences between houses with and without chimneys, I enjoyed. I am also curious as to whether the historical detail in this book is as accurate as I am hoping it is. After all, if you are recreating a specific time period, one would hope that you'd do so accurately. So, the first book is good, although not great. We'll see how the next to turn out. This is the second Knights Templar Mystery, and I'm still undecided about whether I'll continue the series. Again, story was good, and I loved all the historical details. However, there remain problems. As with the first book, there are very abrupt changes in point of view. One paragraph were are in one character's mind, the next paragraph is from another character's point of view. This is both jarring and confusing, although I didn't have as many problems with the shifting point of view in this book as I did in the first. As the writing improved somewhat in this book, I am hoping that the third book will be better, and that at some point an editor grabbed Michael Jecks and made him stop shifting the point of view so abruptly. As I said, the story was good. Simon is visiting Sir Baldwin, when a the body of a local midwife is discovered. Simon and Sir Baldwin can find no real reason for her death, and must try to make the clues and theories fit together. As with the first book, I particularly like the cover. I think that they covers do a good job of setting the tone for the books. I also really liked the historical details. I can see how some people might find that annoying, but I found it interesting, and it doesn't bother me in the slightest if a book goes off on a tangent and presents an historical lecture. I also appreciate the realism that Michael Jecks adds to the stories, about the stench of the homes in the winter, and how smoky the buildings were, and how insufficient the clothes were at protecting people from the cold. Details like that fascinate me, so I appreciate them in stories. All in all, the story is good, and the point of view problem isn't nearly as bad in this book as in the previous. I just have not yet decided whether or not I'm willing to pay $7.50 a book to continue a series that I cannot find used. Okay, I give up. At least for now. Michael Jecks is a good storyteller, I will give him that, but his writing... The Merchant's Partner was sllightly better than The Last Templar as far as his writing style, but A Moorland Hanging is just as frustrating to read as the first book. Point of view changes from paragraph to paragraph, and not always clearly, so once again I kept having to stop, to try to figure out who was thinking and observing. It served as a major distraction from what was otherwise a very good mystery. In the story, Simon and Sir Baldwin are called out to the Moors to investigate problems between the tin miners and the local landowner. A miner is found dead, hanging from a tree, and Simon and Baldwin must decide, out of all the people who might have wanted him dead, who actually killed him. And the mystery is pretty good in this book, although once or twice I did feel that Baldwin was acting a bit too much like Sherlock Holmes. For the most part Baldwin and Simon made a good team, each solving parts of the mystery. As always I enjoyed the historical detail. I never thought much about how mining developed, and as someone who has seen what mining can do to the land, it was interesting to see the roots of how things started. Interestingly, the environmentalist in me was horrified at the descriptions of what the miners were allowed to do, why other parts of me kept thinking, "that is SO unsafe! All that smoke they are inhaling can't be good for their lungs!" and other such really foolish thoughts, considering the time period. I was also interested by the ideas surrounding the moor. The trees were unlike any the knight had seen before; it was as if each of the plants had been shriveled. All were stunted, misshapen caricatures of the great boughs he knew from his own lands. None were more than twenty feet tall, and most were much shorter. "(The trees) certainly are very curious. All the branches point in the same direction--had you noticed that?" "Well, you know the stories, don't you? About the Devil and his pack of wish-hounds baying after lost souls? This is where those stories come from, Baldwin, out here on the moors. They say that the wish-hounds are heard here when the wind blows hard." I found that fascinating because I've know precisely what that looks like. When my parents took us to the top of Spruce Knob they explained why the trees were the way they were, but I remember how spooky and alien I found the landscape. (I believe that it was also very foggy.) So it was an interesting detail that resonated with me. But not enough to save the book from the writing. If someone tells me that in his later mysteries his writing improves, I'll consider picking up this series again, but for now, there is no way I am going to pay cover price for a writing style this frustrating. If I find the books used I'll consider picking them up--because the mysteries really are quite good--but his writing style is entirely too maddening.